Is there anything NuNU doesnt chew? Oh Nunu! 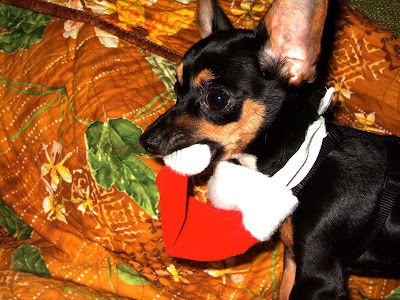 Happy Holidays, I hope "Santa" brings you lots of fun things to chew for 2010.
merry christmas, Jorge,Beth and Nunu! all the best to you,your friends and family. Wait, wait... Does this mean what I think it means?? Thanks so much! I thoroughly enjoyed Nunu's Advent calendar. Is that not the cutest pic ever!!! So cute! This was the best Advent Calendar ever! Merry Christmas Jorge & Beth! This advent calendar was too cute! Thanks for the laugh every day. Thanks for all the cool Nunu pics Jorge. Merry Christmas to you and Beth! Nunu, you "finally" - ate Santa???? Perfect!! Merry Christmas to you, Jorge~~and Beth and Nunu as well. Jorge I have loved your advent calendar... it's been a real treat. Thanks for sharing it with us! Merry Christmas to Jorge, Beth, Nunu, and all the regulars! This will be a big year for you, Jorge - I don't want to see it end, but I can't wait to see how it plays out. Hope all the stockings are filled with Joy. Merry Christmas Nunu! I hope Santa rought you 25 more fun things to chew. My Doogie, Beau, ate a tray of cookies to celebrate the holiday-he is now laying in his bed(w/ a belly ache), without his presents, to think Santa Paws brought him a new bone and doggie bagles and he cant have them because he was naughty. I hope you were a good girl :) Merry Christmas to your parents too, I hope Santa was good to them. And where is the REST of Santa? Did she eat him? very cute! Merry X-Mas Jorge and Beth!!! Merry Christmas, Jorge, Beth, and Nunu! We like your dog and we have a chihuahua too, her name is "Blanquita". We love lost and your blog. Nunu has resorted to eating elves at Christmas!!! Hi Jorge, Beth and Nunu. Thanks for sharing your Christmas calendar with us all. Wish you a happy Christmas and fantastic New Year from Australia. It is actually Boxing Day here now, but what the heck! merry merry merry christmas to yooou! hope it was a most enjoyable day with beth and nunuuu! One more Merry Christmas to you. thank you for a month of ahhs and giggles with your Nunu Advent calendar. Feliz Navidad, Nunu! These post's were really cute, Jorge. Merry Christmas to you, too! Happy Christmas! Health and happiness for you, Beth and Nunu! Ahahaha! Nunu awesome! Nice picture. FELIZ NATAL Jorgeman, Bethy and Nunu. Merry (Belated) Christmas Jorge, Beth and Nunu! And have a Fantastic New Year! Happy Christmas, I enjoyed your Nunu Chew Calendar very much, hope you're having a jolly good time and that you don't have any little visitors to deal with. Here's to a great new year also. Not too long now to wait for the final season of Lost. Just finished watching Season 3 on my annual rewatch to refresh the memory for the upcoming new season and it's still great the umpteenth time around. Now all we need is a 12 days of Christmas list to Nunu. "On the first day of Christmas Jorge gave to me..."
So great to have found your blog (found it trough the moldavian Jeana's blog).. Hope you have had some great christmas days and wish you a great new years to come. all of our giftmas was about the furbabies-we get our boy chihuahua in 17 days..and a wheelchair charger for me.. it was a blast reading the chew-ventures! Hoping your holidays have been wonderful, and your New Year is even better! Aw, thank you Nunu - we enjoyed it! Nice! Nunu ate Santa whole! well... I am now complete. your dog aparently is called Nunu. Jorge, I truly enjoyed reading the Nunu advent calendar and will miss it very much! With this blog, I feel in a way emotionally connected to the things that happen in your life, because you've given us this window into your life. I still laugh about the rat incident and feel like you're just that guy down the street who is an average joe like the rest of us. So forgive me by saying that I felt like a little piece of me died yesterday. Even though Nunu was yours and Beth's, you shared her with the world and all of us who frequent your blog share in your grief. I will never be able to look at "Everyone loves Hugo" the same anymore.